The Arrowverse – the CW’s group of TV shows about DC comic book characters – boasts of a host interesting and strong female characters that have developed into fan favorites and elevated the career of the women playing them. One of those characters is Iris West of The Flash who is played by Candice Patton, an American actress. 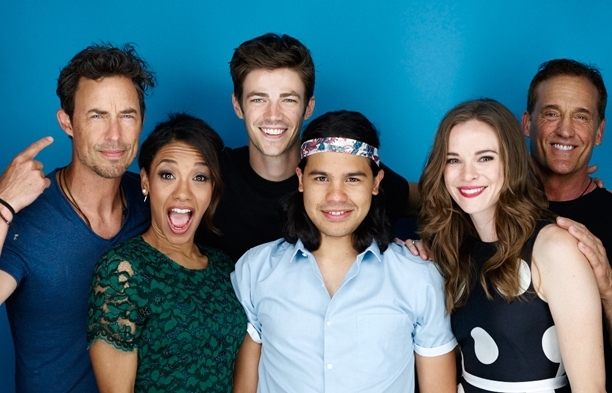 Though Candice has a limited filmography, her prominent role on The Flash has launched her into international fame. For more information about Candice Patton such as her career, net worth and relationship status, keep reading below. The Flash star, Candice Patton, was born on the 24th of June in 1988. She gained her formal training in acting by attending Southern Methodist University in Dallas and graduating with a Bachelor’s degree in Theatre (BFA) in 2007. Candice, who says it’s always been her dream to be an actress might credit her passion for the art to her mother, Arianna Jackson who was a theater actress and opera singer. The second of two children born to Arianna Jackson and Paul Patton, Candice spent her entire childhood in Plano, Texas even though she was born in Jackson, Mississippi. She attended St Paul’s School in Plano for her high school education. Candice Patton’s acting career fully started in 2004 even though she had a few appearances to her name in 2002. Candice Patton’s role on The Flash has so far been her most prominent role till date but before she landed the career-defining gig, she has appeared in a few other shows and movies. The young actress’ first onscreen appearance was in The Young and the Restless, a role she got after winning a CBS’ acting competition in her first year of university. She played the role of Robin on the show and appeared in 5 episodes. Later, she starred in a web series, Sorority Forever, playing Mercedes Muna. Candice Patton has taken roles in several other shows including One Tree Hill, Entourage, Castle, Heroes, Grey’s Anatomy, and CSI: Miami. She had her first feature film appearance in the television movie, The Craigslist Killer in 2011. The following year, she played Dana in Commander and Chief, before landing the role of Sgt. Halway in the 2014 movie, The Guest. Her singular appearance in theater (so far) came in 2002 when she appeared at the Collins Theatre Center in Plano, Texas in a production of Shakespeare’s Titus Andronicus. When Candice Patton was cast as Iris West on The Flash, she faced some controversy because she was an African-American playing an iconic character that was historically white. However, the controversy has since dissipated and she’s gone on to establish herself as one of the leading women in popular television. Throughout her career thus far, Candice Patton has been nominated for eight awards, winning just one of them, all for her work on The Flash. Candice won the Saturn Awards for Best Supporting Actress on Television in 2017. Although she officially started acting in 2004, her acting career did not really take off until 2014 when she was cast in The Flash. Her appearance on the show, the show’s popularity, and her growing fan base have increased her popularity profile, making her valuable for endorsements and high profile commercials. Candice Patton’s net worth is currently $2 million. Patton’s parents are Paul Patton and Arianna Jackson. Paul Patton was an engineer and a musician which may have attracted Arianna Jackson, a theater and opera singer to him. After a few years into their marriage, specifically, when Candice Patton was five, they developed some issues in their marriage and got divorced. It was, however, not a bitter divorce and the actress still got to spend a lot of time with her father growing up. Even though her parents got divorced and she was raised by her mother, both her parents always supported her interest in acting. Candice Patton is currently single. Though her popularity profile has risen and she’s one of the most beautiful women on television, the actress has been able to keep her private life, private. There are no dating rumors about the actress. It appears as though the TV star currently enjoys being single.